Joining an elite group of nations, India on Monday successfully launched its first space research observatory ASTROSAT that will help in a detailed understanding of the universe and also put into orbit six foreign satellites including the first from the US. 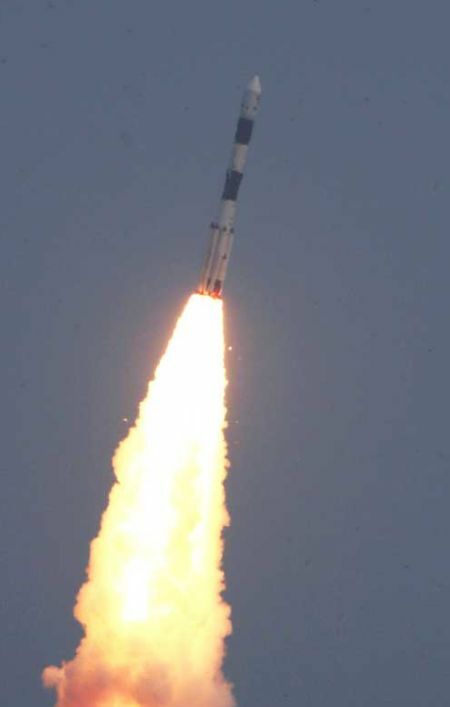 Taking another major step in its ambitious and low-cost space programme, Indian Space Research Organisation’s trusted workhorse Polar Satellite Launch Vehicle, in its 31st flight, injected ASTROSAT and the six co-passengers into orbit about 25 minutes after a perfect lift-off from the Satish Dhawan Space Centre. Launched in its maiden attempt, ASTROSAT, which includes a telescope that uses x-ray, has been dubbed as a mini-Hubble telescope launched by US’ NASA in 1990 and a one-stop shop for studying astronomical sources. So far, only the US, Japan, Russia and Europe have launched a space observatory. “Well done @isro. This is one more grand accomplishment for Indian science & our scientists,” Prime Minister Narendra Modi, who is now on a visit to the US, said in a tweet. Declaring the launch successful amid cheers from the assembled scientists, a beaming ISRO Chairman A S Kiran Kumar said PSLV had put in an astronomy mission, which is being looked at not only within the country but also globally to bring in new information to scientific community. “I congratulate the entire ISRO community for the wonderful job they have done,” he said addressing the gathering at the Mission Control Centre. ASTROSAT has reportedly cost $27 million (Rs 178 crore) to build. It was for the first time that India launched US satellites -- four in all -- belonging to a San Francisco-based company, under an agreement signed with Antrix Corporation Ltd, the commercial arm of Indian Space Research Organisation. With a lift-off mass of about 1,513 kg, ASTROSAT was first injected into a 650 km orbit by PSLV-C30, followed by the other six satellites in the space of about three minutes. International customer satellites that piggybacked the rocket were the LAPAN-A2 of Indonesia meant for maritime surveillance using Automatic Identification System, and maritime monitoring nanosatellite from Canada, NLS-14 (Ev9), which uses ‘next generation’ AIS. The rocket, one of world’s most reliable launch vehicles which clocked its 30th successful mission in a row on Monday, also carried four identical LEMUR nano satellites of a Spire Global Inc, San Fransisco, US, that were non-visual remote sensing satellites ‘focusing primarily on maritime intelligence through vessel tracking via’ the AIS, ISRO said. With this, a total of 51 satellites belonging to global customers from 20 countries, including Germany, France, Japan, Canada, UK, have been launched successfully by ISRO so far. Post the successful injection of ASTROSAT into the orbit, ASTROSAT Project Director K S Sarma said it was “healthy and doing well”. It has a mission life of five years. “This satellite is very unique as we have sophisticated and sensitive astronomical equipment”, he added. ASTROSAT will observe the universe in optical, ultraviolet low and high energy X-ray regions of the electromagnetic spectrum, while most other scientific satellites are capable of observing a narrow range of wavelength band. It will send back data and study parts of the universe including black holes and the magnetic fields of stars.